It is always a joy to meet with the vendors who participate in the Hollywood and Lloyd Farmers Markets. Like the local fresh produce, we welcome fresh new faces to the market. Last year we added SMALL Baking Company. Not only new to Hollywood and Lloyd Farmers Markets – the company and the owner, Joanna Strahm, are both new to Portland. But Joanna’s baked goods are tried and truly delicious. A California native, Joanna grew up loving to bake, and probably knew at an early age that it was going to be her life’s passion. Her first memories go back to three years old, baking with her mom in the kitchen of their Palo Alto home. But it took a journey and time for her creative spirit to reach full bloom in the form of SMALL Baking Company. Joanna specializes in creating small-batch, whole grain baked goods using seasonal, locally sourced ingredients whenever possible. Custom breakfast goodies, desserts, and other sweet treats for special occasions line the menu. After graduating high school, Joanna left the Bay Area for the infamous party school Chico State University, where she met her husband and earned a bachelor’s degree in Communications. Diplomas in hand and with high hopes they moved to San Francisco – the year 2008. It was a difficult time; the financial markets were in turmoil, companies weren’t hiring, and getting a job, any job was a miracle. So she took what she could find. One of her first jobs was working at a non-profit doing fundraising and development. Then she moved on to Task Rabbit when it was a startup. Joanna is not afraid of taking risks- and the learning from each experience helped to develop her entrepreneurial spirit. These jobs also confirmed something she knew in her heart:- sitting behind a desk was not for her. Since baking kept calling her name, why not see what she could do to make her dream a reality. Enrolling at the well-known Tante Marie’s Cooking School in San Francisco, she knew that she was filling her soul’s desire. But what career choices are there for a fresh baker? Typically, bakers only have a couple of options: Large production kitchens that serve businesses such as hotels, catering, making pastries for fine dining; or the smaller, more personal bakeries. Joanna soon became an intern in the well-known Tartine Bakery, a destination for locals and tourists in San Francisco. Each day from breakfast to dinner, the bakery is in high gear. On an average day, between 600 and 1200 people are served out of the Guerrero Street storefront, so timid bakers need not apply. It was here she learned just how much she loved the smaller bakeries, serving a regular clientele, tourists, and those on a weekend excursion to San Francisco. Upon leaving Tante Marie’s, Joanna jumped at the opportunity to work for a local shop, Batter Bakery. As a regular vendor at the Saturday Ferry Plaza Farmers Market, Joanna discovered how much fun working the farmers markets could be. More than just selling the latest baked goods, it was a way to purchase weekly produce, find seasonal inspiration for new recipes, catch up with market customers and neighboring vendors, and enjoy a day of being outside. Batter Bakery allowed Joanna to develop her skills as a baker, and as an eventual business owner. Packaging cookies was the beginning step, but within two years she was the kitchen manager. As a baker, she learned how to create and scale recipes and even how to fix a botched one. With the owner of Batter Bakery as her mentor, Joanna gained valuable and necessary knowledge on how to find wholesale accounts, create beautiful gift boxes, find suppliers, negotiate contracts, manage inventory, and more. But San Francisco got too big, and she and her husband were no strangers to the Pacific Northwest. With ‘lots’ of their family in the area, Joanna and her husband moved to Portland in 2016 with the blessings of Batter Bakery. 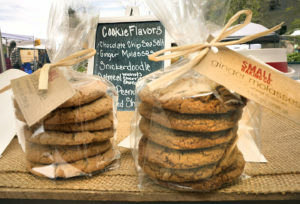 The initial plan was to establish a Portland-based branch of Batter Bakery within a year. But the venture soon proved it would not be profitable. And Joanna was itching to make her own recipes. The time spent trying to get Batter Bakery set up helped her build crucial relationships with farmers, suppliers, and cafes, which was instrumental in starting her own business. But she had to act fast. Her cafes had already placed orders, and the relationships she had worked hard to build would be lost if she didn’t take action. In her typical “can do” fashion, within four weeks Joanna launched SMALL Baking Company. Orders were filled without missing a beat. Already familiar with attending farmers markets in San Francisco, she contacted several in town and found the Hollywood and Lloyd Farmers Markets. SMALL Baking Company is a one-woman show. Preparing the batter starts early in the morning followed by hours spent baking – the aromas must be intoxicating. Her days continue with delivering the orders to the cafes, events, and the farmers markets. Her personalized service has helped her business grow, but to continue providing the level of service she enthusiastically gives her customers, she needs to clone herself- or find a couple of people to help her brand become commonplace without losing its character. Using the freshest, seasonal ingredients, locally sourced whole grains from Green Willow, local butter and eggs, and making small batches of 15 to 18 products on any given week has made her often-whimsical fare unique among Portland bakeries. Using local ingredients is also a way to support other small businesses and vendors. SMALL Baking Company’s menu includes such delights as frosted cookies in fanciful shapes (maybe frosted unicorns for a special occasion ), cupcakes, decorated shortbread, challah, cakes, quiche using locally grown vegetables, sweet and savory scones, and even savory galette. Her personal favorite is the lemon glazed ginger cookie. Serving six cafes, four local farmers markets (Hollywood, Lloyd, King, and Pioneer Square), and special events like the Portland Night Market doesn’t give time for much rest, but she wouldn’t rather be doing anything else. She loves the farmers markets; they provide a great community where vendors can share stories, successes, and opportunities. Hollywood is her favorite. She loves the market community, the music, and business has been strong. 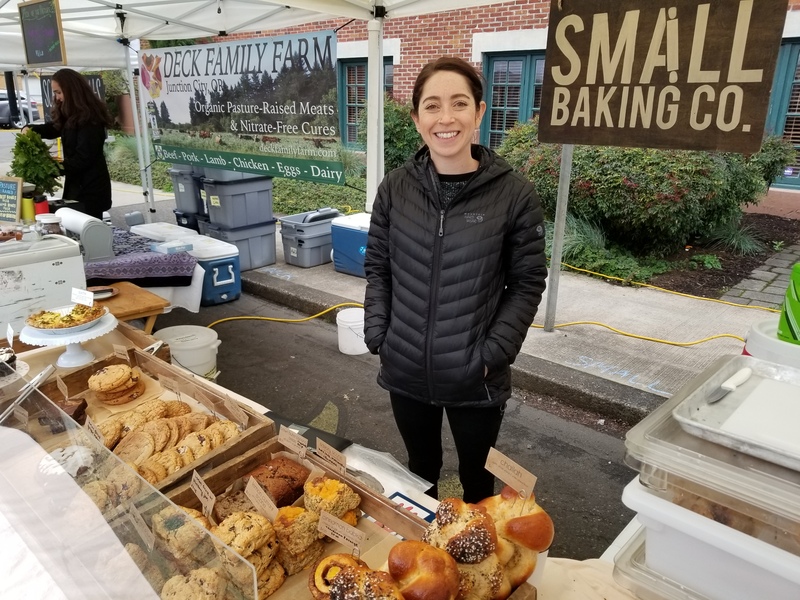 Hollywood Farmers Market is thrilled to have Joanna’s bright smile and her delicious assortment of baked goods available, so stop by and say hi, and take something home with you. In addition to the cafes and farmers markets, Joanna provides her delicious, gourmet treats for weddings and other special events. To contact SMALL Baking Company directly, send an email to Hello@Smallbaking.co.